Cold weather always makes me feel like eating soup. When it's freezing outside, I want to eat something hot to warm up! 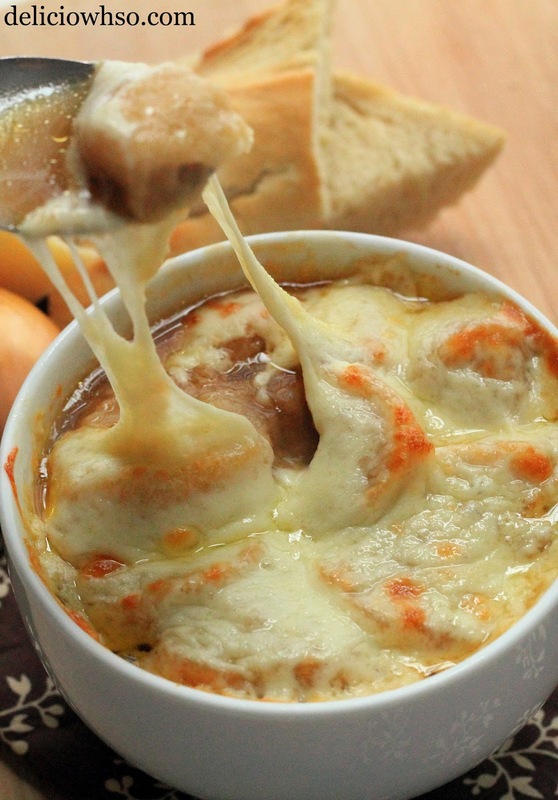 French Onion Soup has always been a favorite of mine. It's comfort food at its finest. The warm, rich broth with soft bread and stringy, melty cheese- there's nothing better on a cold day! 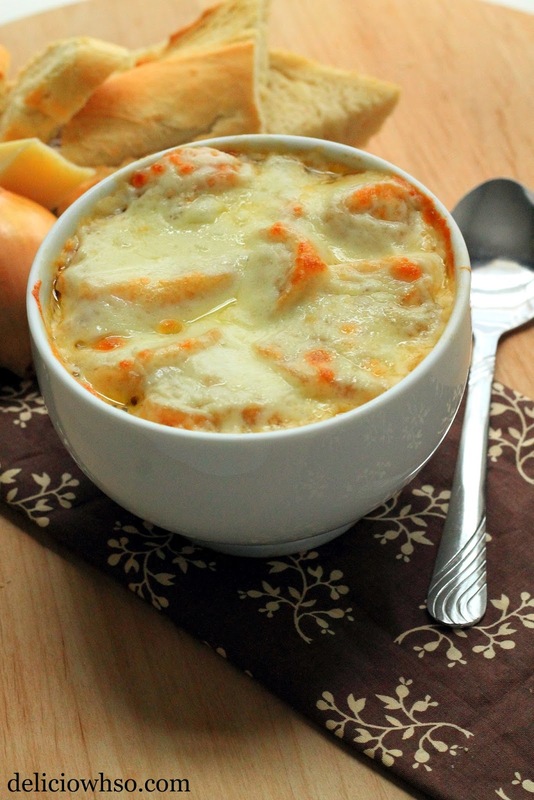 This recipe for French Onion Soup is simple to make, and doesn't require too much attention. 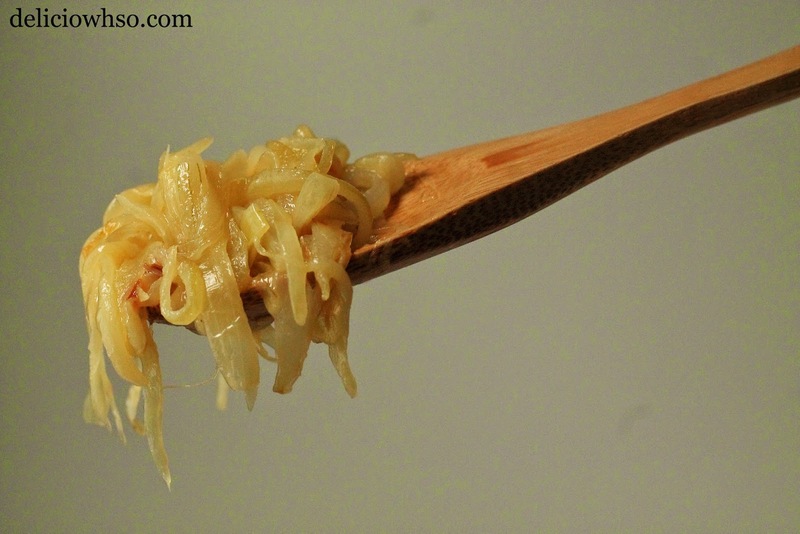 It takes a little bit of time to properly caramelize the onions, but it's worth the wait! 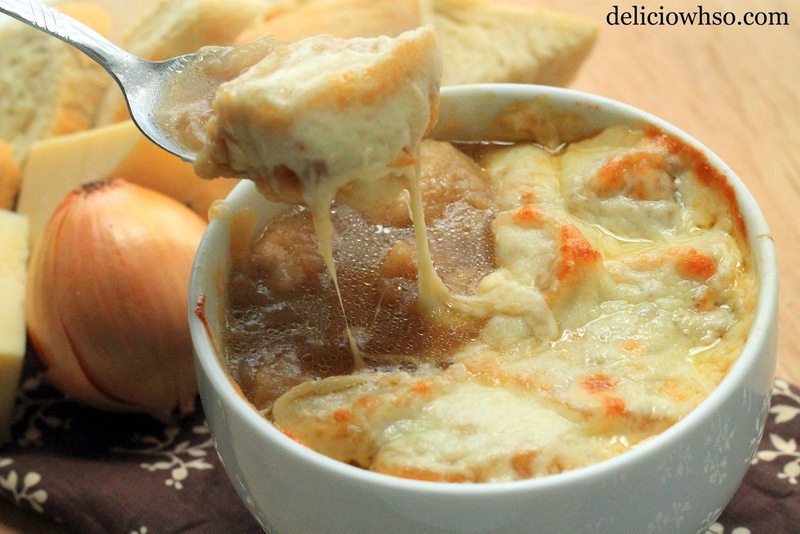 French Onion Soup is traditionally made with a little wine to deglaze the pan, but I make mine without it. The flavor is still rich, deep, and onion-y. 1. Slice the onions into thin, 1/4 inch slices. 2. In a medium pot, melt butter on medium heat. 3. Once the butter is melted, add the onions. Mix the onions to coat with butter. 4. Turn down the heat to low. Continue to cook the onions, stirring occasionally. 5. Cook the onions for about 30 minutes, until caramelized. Don't rush this process, because you want the onions to be perfectly caramelized for the soup! Here's a picture of the finished onions. 6. Add the garlic and gently mix into the onions. 7. Add a little bit of beef stock to deglaze the pot slightly, and then add the remaining stock. 8. Raise the heat to bring the soup to a boil, and then return to low heat to simmer for 45 minutes. Simmering the soup allows the flavors to develop fully, so that you can enjoy a full-bodied onion flavor. 9. Preheat the oven to 475 degrees F.
10. Slice the bread so that you have 8 slices. You can toast them slightly if you'd like. 11.Place 4 oven-safe bowls onto a sheet pan. 12.When the soup has finished simmering, pour into the oven-safe bowls. Place 2 slices of bread and 2 slices of cheese over the top. 13. Place into the oven for about 5-10 minutes, until the cheese has melted completely and browned slightly. 14. Remove from oven, place the bowls onto soup plates, and serve immediately. I've also reached 10,000 page views as of yesterday! A HUGE thanks to everyone keeping up with this blog, and sharing with their friends. Continue to share, create, and enjoy!